On June 23, I left Cannon Beach, Oregon on my Surly Long Haul Trucker. 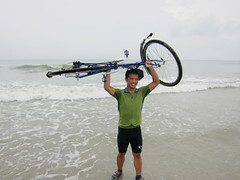 54 days and 3578 miles later, I arrived at Folly Beach, South Carolina. It was the conclusion to an epic adventure. I was challenged in many ways, met countless terrific people, was pushed physically and recharged mentally. I got to visit old friends and made new friends. It was a lot of what I expected and then plenty of unexpected. It took me three days to bike from Elberton, Georgia to Folly Beach. 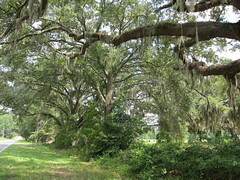 South Carolina is old plantations, Spanish Moss, dense forests, slow rivers and small communities. 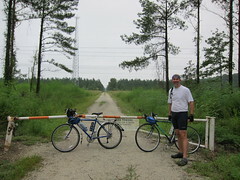 The heat and humidity made the ride difficult. John Williams, who assists me in wrestling, his wife Wendy and their daughter Sophia made things easier by picking up the trailer and panniers. I could ride without the burden of pulling an extra 50 or so pounds. I estimate that I was about 3-5 MPH faster without the weight; the biggest gain came in climbs. So I got to ride unencumbered and John, Wendy and Sophia hung out at the pool or beach. It worked out great and I can't thank my friends enough for coming down. So I make it a bit over 50 miles when John and Wendy catch up with me on Thursday. They grab the trailer and feed me fresh fruit and drive on. I pedal the next 40 miles and meet them in Aiken, a great town when it's not 180 degrees outside. The next day, I am off riding early and John, Wendy took Sophia to Edisto Island for her first visit to the beach. 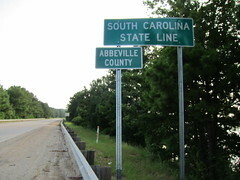 The final day, Saturday, was about 60 miles from Walterboro to Folly Beach. 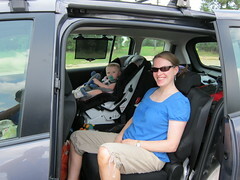 Matthew and Erica Johnson drive down with their five month old, Eliza, so that Matthew can ride the final day with me. It was nice having the company of a great friend and awesome athlete. Matthew is a friend from church, a sick Ultimate player, the lead teacher at Glen Marlow Elementary and the guy who has given me scars mountain biking. Matthew and I always ride the trails together, so riding the pavement with him was a new experience. But we took turns drafting and just tore up the first 40-45 miles until fatigue started setting in. Funny thing is that in 54 days of riding, I've never had to ride in the rain. It has rained at night, but not when I was on the bike. I was totally prepared for the rain-- I've got Goretex gear, fenders, drybays and they weren't called on. Matthew and I are trucking down Folly Beach Rd with the end very near in sight when the skies just open up. Not a just shower; it was a deluge. I turned and asked if he was okay with this and he replied, "Yeah! We're so close." So we trudged the last mile and half in an absolute downpour. When we got to the town of Folly Beach, the streets were flooded with 4-5 inches of water. We're totally saturated... and we're loving every moment of it. At the Holiday Inn, John is waiting along with Chris Stevens (and here), a Georgia Tech Superfan, and his buddy Victor. Congrats, high fives and hugs are given all around. When the clouds break, we head to the Atlantic, where Bella and I step into the ocean to conclude our trek. After that, champagne toast courtesy of Chris's foresight and thoughtfulness. It was a great way to finish. 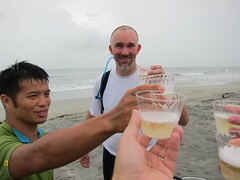 Exciting ending in the rain, super friends, champagne on the beach. And how do I know it was a great ride? I don't hate my bike. After almost 3600 miles, I'm ready to get back on a bike and ride. So call me up-- we don't have to go cross country, but I'm up for a road ride or some singletrack in Dupont or Bent Creek. Welcome home Heang! Glad to see you made it! I am slowly working on my first ever trek to Moline,Illnois next spring. It was an honor to meet you and an inspiration to my upcoming ride. Keep in touch and send me an email please. Alan in Adams,Tn. Cheers to you my good friend.